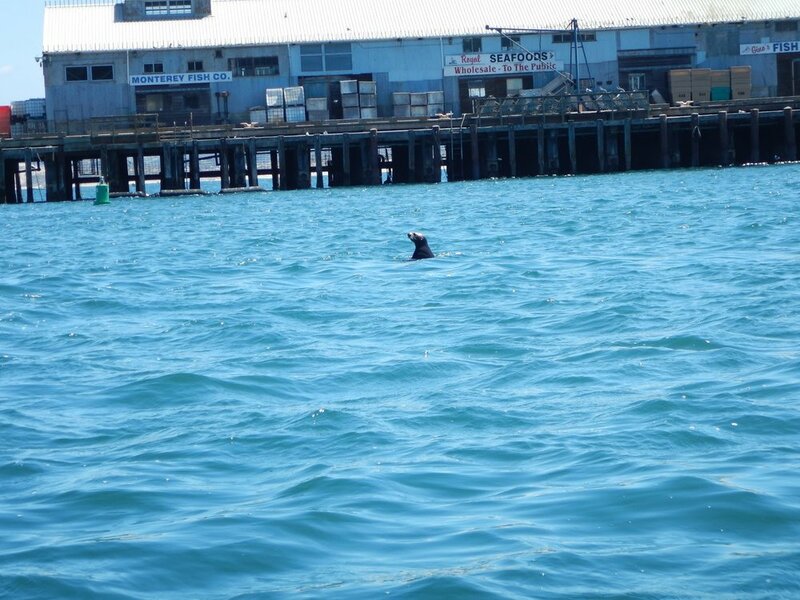 The best place in all of California to see marine mammals is Monterey Bay. Several hundred humpback whales spend more than half the year feeding just off the coast, harbor seals sun themselves on rocky islands, and an enormous colony of sea lions has taken over the seawall in the harbor. The best way to see the abundance of wildlife is from the water, so on a sunny but windy Saturday when my dad and stepmom were visiting, we rented kayaks and followed our guide out into the turbulent (and slightly intimidating) surf. Our 90-minute tour took us on a loop under the pier, through the harbor, and along a seawall covered with starfish and anemones. We saw two sea otters poke their heads up for a moment, making their way through the ship canal. Then, when we got to the calmer, more protected area of the waterfront, we came across 10 or 12 chubby-looking harbor seals who appeared to be in the middle of their afternoon nap. They were perched on their sides on the dry rocks, holding their tails out of the water and flaunting all their blubbery glory. When we approached the seawall, we were overwhelmed by the sound of a hundred barking sea lions. They lay sprawled across the rocky surface, pig-piled on top of one another and loudly complaining about it. Some of the smaller ones were wrestling for position, and the loser of each battle would be pushed into the sea until he could swim up to another rock and try all over again. They behaved almost like loud, clumsy labradors. 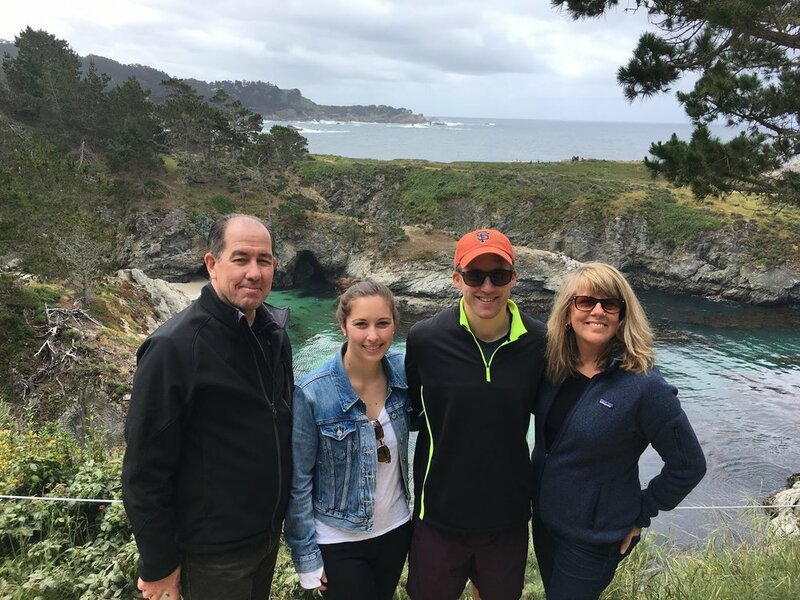 After we each accomplished the tricky beach landing in our kayaks and changed out of our wetsuits, we drove the iconic, incredibly scenic 17-Mile Drive through the Pebble Beach golf resorts. The road passes through the lush forest atop the small peninsula before dropping down to the sea, where it winds past beautiful coves and wind-swept sand dunes. We stopped for lunch at The Bench, a restaurant overlooking the 18th hole, and admired the view of Carmel-by-the-Sea to the south. On our way to dinner we took a pit stop at Carmel beach, which in the pre-sunset glow was full of locals taking an evening stroll or walking their dogs. The beach has perfect powdery white sand and is lined with green hills; it's picturesque no matter the season. Dinner was at an Italian spot called Portabella, where the highlights were mushroom risotto, a local cheese plate, and a seafood linguine in a lobster cream sauce. That night we stayed at the Carriage House Inn, a charming bed and breakfast in downtown Carmel with enormous plush beds, in-room fireplaces, and jacuzzi bathtubs. In the morning we were brought breakfast in bed on a tray with a fresh flower and the local newspaper. It wasn't easy to motivate ourselves to emerge from the rooms for our second day of adventures. 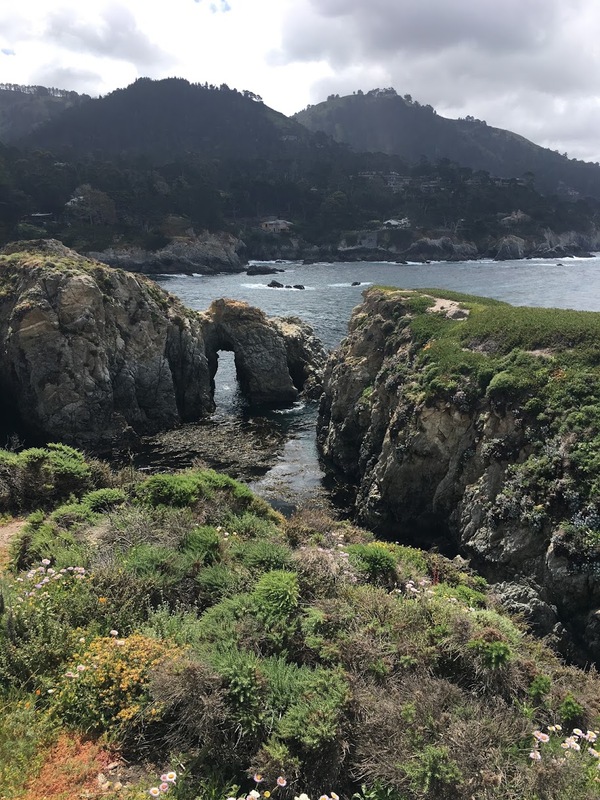 From breakfast, we drove a few miles south to Point Lobos Natural Reserve to do some hiking. The park itself isn't very large, but there are a dozen or so trails that span the entire coastline of the peninsula, plus a few more in the forested highlands above. The views were beautiful and the wildlife viewing was unbeatable. Within our first minute on the trail we spotted two sea otters, and from there it just got better and better. With a pair of binoculars (highly recommended) we could see rafts of sea otters floating on their backs and bashing rocks against sea urchins on their stomachs to get to the soft flesh. When they weren't eating — which is pretty much all the time, because otters eat 25% of their body weight each day — they were playing around with one another, doing flips and turns at the surface of the water and jumping on top of their friends. They were so playful and funny we thought they must be putting on a show for us. We also spotted small groups of harbor seals swimming circles in the crystal-clear turquoise waters of tiny inlets, looking quite similar to families of overweight mermaids. Sometimes when one of the mothers lifted her head above the surface of the water we could hear her calling out to her babies. When we hit the road to head north to the Bay Area, we decided to stop one more place that our kayaking guide had recommended: Elkhorn Slough at Moss Landing, which is a calm inlet located about halfway to Santa Cruz on the Monterey Bay coast. We were lucky to discover that this spot provided the best sea otter viewing yet. About 30 of them, mostly older males with white heads like gray-haired grandpas, were lazily floating on their backs about five or ten feet offshore. Most looked to be sleeping, and had both paws resting on top of their closed eyes, which was possibly the most hilarious animal behavior I've ever seen. One guy kept flipping around and around from his back to his front, but kept both arms raised to keep them out of the water, which was equally entertaining because it looked like he was dancing. Now I know I have a slightly abnormal obsession with sea mammals (they're so darn cute I can't help it! ), but I would recommend a Monterey Bay weekend to anyone who enjoys outdoor activities and beautiful scenery. Between kayaking, hiking, animal-watching, and beach lounging, there's more than enough to keep you occupied for a long weekend.